The Bulldog volleyball team made their 2017 home opener an abbreviated affair Tuesday at Bulldog Pit, blanking the Eagles of Class 6A Hobbs in three straight games. A few service errors and misfires on offense extended the first two bouts of the match slightly, but the ‘Dogs took control early in each set and left no doubt as to who was setting the tempo. Wins of 25-15 and 25-16 put the Eagles on the ropes, and Artesia saved the best for last, logging a quick 25-14 victory in the third and final game. 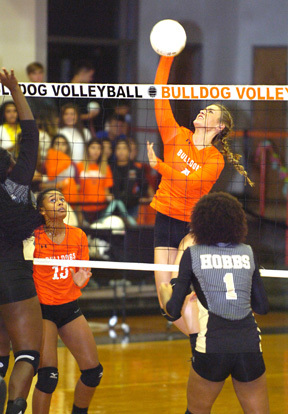 Hobbs had the advantage through the first few points of Tuesday’s opener as the teams traded side-outs, but Bailey Pearce was finally able to settle in at the line for the Bulldogs, serving up three straight – including a pair of aces – to make it 7-4 Artesia. A pair by Kyrah Gonzales a few trips later put the ‘Dogs up 12-7, and with help from a Stacia Martinez kill and a point apiece from service by Martinez and Alexa Riggs, Artesia took a comfortable 16-9 lead. The Eagles were able to cut that to three before an Elliot Harrison ace and a kill by Paityn Houghtaling ended the rally, and Pearce would serve out the final five points of the game, punctuated by an ace and a Mattie McCombs spike. The early goings of Game Two comprised another side-out battle, but with a service point gleaned here and there, Artesia led 13-11 midway through. McCombs was able to break up the tennis match with a five-point service that included an ace and kills from Houghtaling and Dezaray Boyce, and three points from the line by Gonzales quickly made it 23-12 Bulldogs. Hobbs was able to fend off the inevitable through four side-outs, but a solid hit by Pearce ended the game, 25-16. Artesia established its offense a bit earlier in the third set, as two from the line by Kacey Thurman gave them an early edge, and four points from Martinez made it 10-3 with help from a string of kills by Kamryn Carrera. The ‘Dogs chipped their way to a 16-9 lead late, and Riggs and Kersie Beltran would combine for the final seven service points, aided by a trio of well-placed kills by Gracie Puentes. Pearce finished with seven kills and a trio of aces on the night for the Bulldogs, followed by Houghtaling with four, while Thurman logged five digs and Gonzales 10 assists. The girls in orange will now prepare to head to the Zia Classic this weekend in Roswell. Pool play will begin at 9 a.m. Friday, and Artesia will open against Williams’ former team, Lubbock Christian. Also included in the ‘Dogs’ pool are Roswell High, Hobbs, Ruidoso and Santa Fe High, while Goddard, Espanola Valley, Clovis, Carlsbad, Lovington and Belen comprise the second pool. Bracket play will follow Saturday. “All four of the teams in our district will be at this tournament, along with Espanola Valley, which is a competitive school in our class, so this is a tournament we need to do well at,” said Williams. “I’m just hoping to see us build on our success from the last tournament and improve a little bit on offense. We struggled a little last night with our serving, so hopefully we can win games with our serving this weekend and not hurt ourselves.